The unusually bright quasar is located 13 billion light-years away. A faraway galaxy is blasting out the brightest radio emissions ever detected from 13 billion light-years away, and astronomers say this ultra-luminous celestial object — what's known as a quasar — could unlock clues about our universe’s early beginnings. Astronomers at the Carnegie Institution for Science and the National Radio Astronomy Observatory (NRAO) spied a jet of plasma spewing from the newfound quasar using a network of 10 radio telescopes across the U.S. and the U.S. Virgin Islands known as the Very Long Baseline Array. They detailed their discovery in a pair of papers published online July 9 in The Astrophysical Journal and The Astrophysical Journal Letters. “This is the most detailed image yet of such a bright galaxy at this great distance,” Emmanuel Momjian, an astronomer at the NRAO and one of the scientists who observed the quasar, said in a written statement. Quasars are distant galaxies with supermassive black holes active in their cores. The Milky Way does not have a quasar because the supermassive black hole at the center of our galaxy is “dormant,” Eduardo Bañados, a Carnegie-Princeton fellow at the Observatories of the Carnegie Institution for Science and the astronomer who first spotted the quasar, told NBC News MACH in an email. Instead of swallowing matter into its swirling black mass, about 10 percent of quasars shoot radio emissions almost as fast as the speed of light into space. The quasar, called PSO J352.4034–15.3373, is one of these unique celestial objects — and one of the brightest. Faraway quasars have been discovered before, and even brighter ones have been observed, but none have been both so distant and so bright, according to Zoltan Haiman, a professor of astronomy at Columbia University in New York City, who was not involved with the new research. 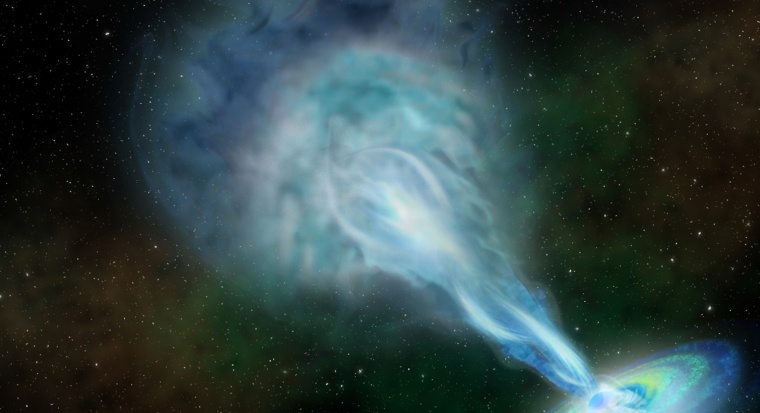 “This quasar is ten times brighter in the radio band than any previous object seen in the early universe,” Haiman told NBC News MACH in an email. And because light from this quasar has been traveling through space to Earth for 13 billion years — less than 1 billion years after the Big Bang, which is thought to have occurred 13.82 billion years ago — astronomers can learn about how the universe and some of its earliest galaxies formed. One thing that Haiman says scientists can learn from this quasar is how the early universe emerged from its so-called "Dark Ages" — when some form of radiation mysterious cleared its veil of light-trapping hydrogen gas, revealing the nascent universe's stars and galaxies. In follow-up studies, Bañados said he and his colleagues will try to understand how supermassive black holes are formed and why there are only a handful of radio-emitting quasars in the early universe.